Hello for the last time from Oaxaca! We decided to have our seniors, all of whom have been down here at least once before, write today’s blog. Yesterday we pioneered a new Simply Smiles tradition, hosting a fiesta for our neighbors here in Coyotepec. We didn’t know what to expect because this was the first time Simply Smiles had reached out to the community around the Center of Operations. It could not have been better! The Choaties + our kidnapped Hotchkissian personally slaughtered 35 chickens with our bare hands (don’t tell Customs). 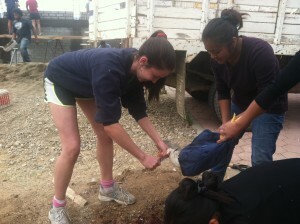 We learned the quickest and least painful way to kill a chicken, defeather it, and pull out the innards. We watched as Lula and Chimi, who came all the way from Santa Maria to help us cook, prepared one of the best meals any of us have ever had. The party was slammin’. We didn’t have music, but being flexible (because flexibility is fun! ), we improvised our own Mariachi band, comprised of Caroline, Shifaa, Emily, Kelly, Alisha, and Chloe. Kristen even graced us with one of her songs. Even though we were all strangers, everyone who came was extremely open and gracious, making for one unforgettable evening. And by the end of the night, strangers had become new friends. However, there is still work to be done with perception. After asking a little boy what his name was and not getting a response, his mother explained how this boy who lived in the dump had been traumatized when a group of “gringos” [not Simply Smiles volunteers] came into his house and took pictures. To this day, this little boy, his mother conveyed, still was unsure of whether “gringos” are good or bad. Hopefully, having more of these fiestas will help convince this little boy and others like him that however different our origins may be, all humans are more similar than different and therefore, he does not need to be afraid. Even though this is the last trip the seniors will likely make with Choate, we all hope to come back in the future. And wherever we are, Simply Smiles and this experience will always be part of us and the choices we make.